Game? Stream? Download a lot of big files? Work from home and need reliable, fast internet connection? Our fiber internet will definitely meet your needs! The faster speed we offer will make your experience using the internet much more efficient and enjoyable. Our customers tell us they can do so much more and everyone in the house is much happier! Let us make you a speed demon with our fast fiber connection! You’ll get an unbelievable 250M of speed that is virtually uninterrupted. 250M is more than any other company in our area can offer. Fancy yourself a super streamer, goliath gamer or so into tech that you just might still live in your parents’ basement? 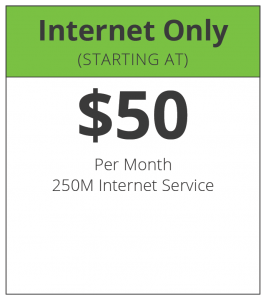 Upgrade to 1000M (1G) for only $50/month more! DayStarr offers fixed prices with no long-term contracts. Stop staring at your screen and waiting for it to unfreeze. Call DayStarr today and and say no to buffering!